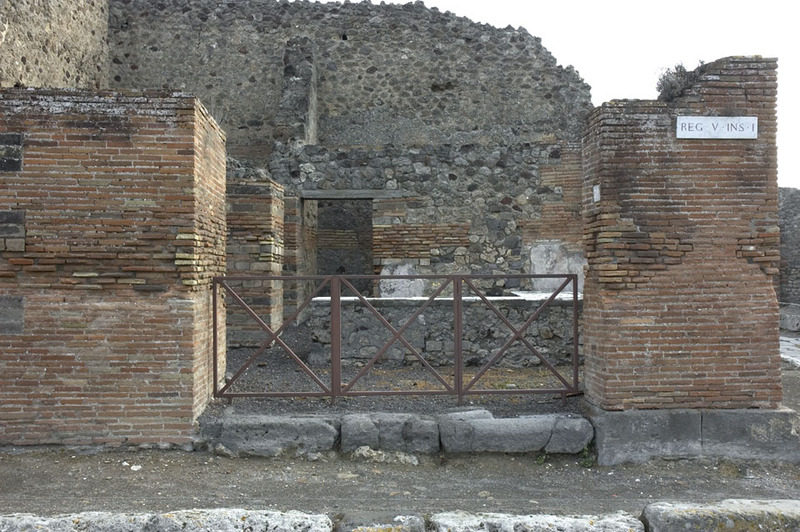 The building is a larger taberna situated at the SW corner of insula V 1 in Pompeii. The structure consists of four rooms, one large front taberna with a counter facing two ways, to the large door openings to Via del Vesuvio and Via di Nola, and three rooms all accessible from the main entrance room. The building was identified as a thermopolium di Fortunatus by della Corte (CIL IV 831; Della Corte 1964, 126), here I use the term taberna, as a neutral word and to avoid the functional connotations. The rooms are numbered 1, 2, 6 and 7 since the early excavators connected the building with the neighbor V 1,2 and numbered the rooms in sequence along Via di Nola. To the north, two rooms open to the main entrance room of the taberna, the western with direct access from the area in front of the large counter, the eastern room (6) opening to the area behind the counter. The western room 7 is larger and connected by a wider door way to the area in front of the counter, in some sense related to the â€™costumers areaâ€™ of the taberna. The rooms are interconnected with a with a large window at a height of c. 1.5 m. Room 7 has a window of approx. same size and height as the one between the rooms, facing the street. Room 2, the east of room 1, is a cramped oblong rectangular room, with no visible feature except for a terracotta pipes in the west wall (see below). Massive brick wall of the faÃ§ade to the south, and there is no staircase to upper floor. Rooms 2 & 6 are related to the same space behind the counter. The building was investigated in sept-oct 2011. Due to the archaeological situation with unexcavated areas in rooms 2, 6 and 7, further investigations are vital for the understanding of the building history and function of the complex V 1,1.32. 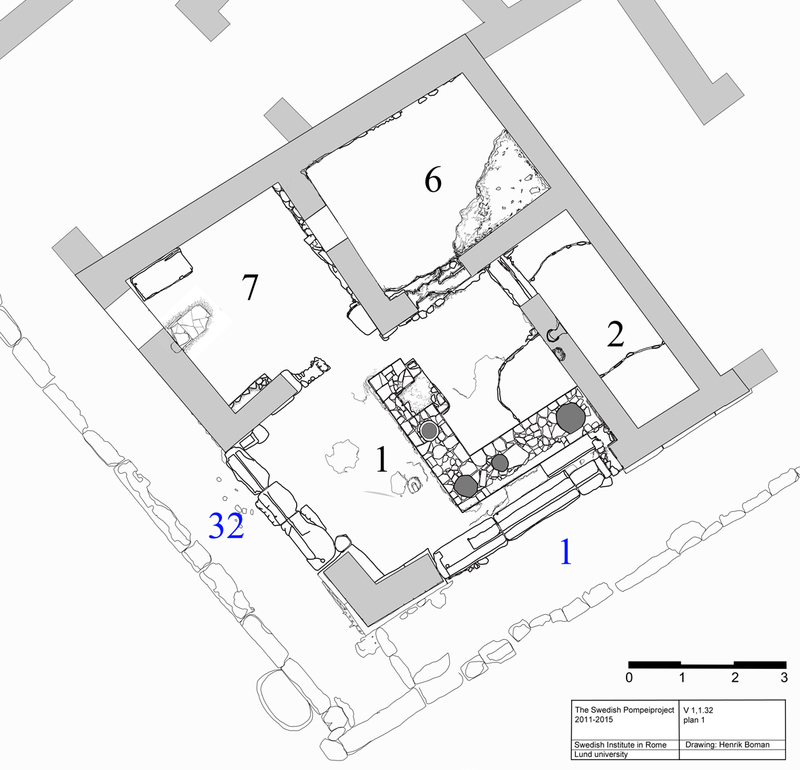 The documentation and analysis of V 1.1.32 is financed by Stiftelsen Enboms donationsfond in 2011 and 2012, in this study aiming to document one of the first excavated edifices in Pompeii. This project also tries to increase the efficiency in documentation work in the field by digitals means. I wish to express my gratitude to Stiftelsen Enboms donationsfond. 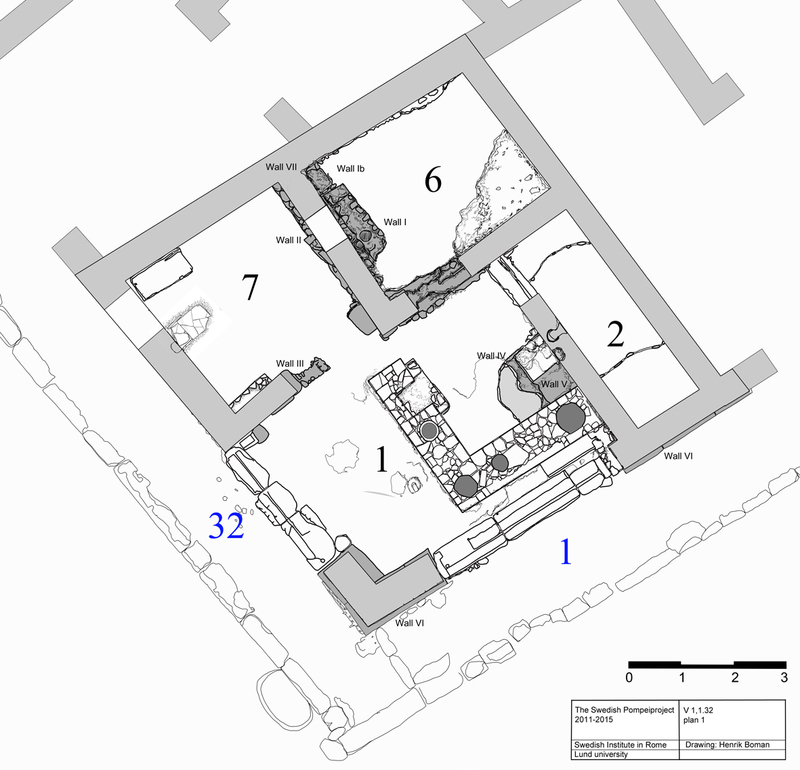 In Eschebach 1993 the main room (room 1) is described to contain a counter with four vessels and a hearth, a step and a podium in front of the counter (in door 1), a latrine under a staircase to the second floor. Today, some of these features are identified: the counter with four vessels and a hearth, the steps and podium, while no traces of the latrine and a staircase to upper floors were found during the 2011 investigations. Room 6 is labeled as dormitorium, no argument for the identification is presented. Today, no features are visible that could confirm this interpretation or any other interpretation. The only clue to the rooms function is the location behind the counter. In Room 7 Eschebach locates two supports for a table and the foundation to a staircase. Today we found a heavily restored brick construction in the SW corner that could have been a support for a table, and a latrine in the area where Eschebach placed the second support. In the corner there is one large lime stone block, which is placed here in modern times. There are no remains of a stair case and there are no remains of an upper floor in this room today. Concerning the appearance of the model in the museum in Napoli as a record of documentation and evidence for the state of preservation on the remains in the late 19th century, some brief comments are necessary. Based on visual observations of model as exhibited in the museum, we can comment on two points essential for the reconstruction of the appearance of the taberna V 1,1.32. -	The wall between rooms 6 & 7 are massive in the model, there are no internal window. -	Further, the beam holes in the N wall in room 6 is missing in the model. In the first plans presented the buildings V 1,1.32 and V 1,2 were identified as one building. The assumed door between room V 1,1.32, room 2 and V 1,2, room 3 is a breach made by tunnellers, either the earliest excavations or a result of the recovery process after the eruption. The shape of the breach; high and round cut at the top, signifies the Bourbonian excavations in style. The masonry around the cutting shows no signs of a door post or any other feature that could be described as a door. Breaches of the same character made by tunnellers is also found between room 1 and 2, in room 6 to V 1,2, and in room 7 to V 1,31 and V 1,2. Presumably the result of a systematic search through the buildings in the SW corner? During the cleaning of V 1.1-32, several walls of earlier date emerged. In rooms 1, 6 & 7 walls at lower level than the 79 AD floor level, became visible. In rooms 6 & 7 the floor were completely missing (presumably not installed in the latest phase of the building, phase III) - the early date for the excavation and the fact that the remains were left in the open air, makes the status of the preservation, especially concerning the floor, dilapidated. The area was filled with debris from the eruption, and from later post 1748 activities in the area. The earlier walls functions partly as foundations for the standing structures for rooms 6 & 7. Only the top of the walls were cleared, no floor was found connecting to these specific walls. The following structures (Walls I-VI) have been interpreted as earlier remains of the building and the structural sequence have been constructed in three phases (phase I-II), with the now standing walls (wall VII) in the third phase (phase III): see further below for more detailed descriptions. It is important to point out that there are no archaeological finds that could date the structures. Wall I-Ib: In room 6, presumably the earliest wall in the building. Possible door frame in stone, with foundation for threshold (wall Ib?)? Phase I. Wall II: Wall constructed abutting to wall I, acting foundation for the later wall VII between room 6 & 7. Possible threshold stone, in lava, connecting to door opening with wall III? Phase II. Wall III: Remains under the wall between rooms 1 & 7, with possible threshold stone in lava? Phase II. Wall IV: Part of a wall (1.1 m visible of east face) in room 1: same orientation as walls I & II, but the wall is not in line with these structures. Phase I? Wall V: Wall in right angle to wall IV, very fragmented and identification as â€˜wallâ€™ uncertain. Phase I? Wall VI: Tufa foundations for the S faÃ§ade of the insula. Acting foundation for Wall VII. Phase II? Wall VII: brick walls now standing. Phase III. Two distinctive floor levels became visible, both constructed in cocciopesto. The earlier (floor I) only visible in room 1. The floor in room 2 is connected to floor II in room 1. Floor I: Earlier floor in cocciopesto, found under floor II and over wall IV. Phase II? Floor II: The existing floor in room 1, in cocciopesto. Connected to floor in room 2. Phase III, Connected to wall(s) VII. The walls I - VI are all built opus incertum, the stones are discolored and it is not possible to determine which type of stone it is. Large amount of mortar used. Only c. 0.2 m of the walls was exposed. Plaster found on parts of the walls, though no wall paintings or other datable features other than the sequence between the walls were preserved. Debris on 79 AD floor level: In the SE corner in room 6 a layer was found at presumed floor level. Debris of different character, first interpreted as a floor level due to two larger pieces of cocciopesto floor visible. The material is in level, the character is more similar to a layer of debris, presumably from the activities after the excavation. A single piece of bronze (a needle?) was found. Room 6 was only cleared along the walls, the central area were left in level of 2011. By the N wall: a thick layer of grey ash, with a piece of a large vessel (not excavated), a broken glass vessel and stones lying in the pure ash. Smaller areas with burnt debris of unknown origin, otherwise very few finds. It seems to be a combination of modern accumulated earth, eruption debris, found directly under the layer of the modern lava gravel. The layer is clearly of significant thickness, though the depth was not possible to investigate. The layer continued along the E wall with a ash layer (hard, light grey), thick, partly hardened and burnt debris found, though as along the N wall, few finds. The layer was not removed. The full extension not established. A layer of earth mortar found by the west wall covered the earlier walls in this area. The layer was removed (earth mortar of this kind was found at several locations in the building). Here, we could assume that the mortar was material for a foundation to a now completely destroyed floor, or more likely concerning the situation in room 7, a floor never constructed. The earth mortar was located only on top of the wall, not on the earth layers around the wall. The sequence between the walls is straight forward, though information about chronology is lacking: Wall I/Ib is built against Wall II, the latter is visible under the now standing W wall (Wall VII). On wall I, a plaster layer is visible, onto which wall II abuts, giving wall I the earlier date sequentially. Wall I ends approx. 0.6 m from the N wall and extends in a smaller, badly preserved wall (wall Ib) (W: c. 0.3 m) to the standing N wall. At the limit between the walls, a larger lime stone block extending the full width of the wall, a structure that could be a door frame? It is not possible to establish if the wall continues under the N wall. Wall I seems to continue to the south, though cut down (in present state), and there are large amounts of yellow lime stone splinters in the area (a similar situation as in room 7). Wall I is built in large amounts of mortar (light colored, with large red brown intrusions) and stone (lava stones visible) and there are still visible imprints of removed stones at the top of the wall. One large lime stone block continues from wall surface to wall surface (0.4 x 0.25 m), by wall Ib. A terracotta pipe (diam: 0.2 m; 0.4 m deep as possible to establish). The pipe was filled with earth mortar and is located c. 0.15 m from the E surface of the wall. There is no plaster on the wall surface facing east, though the mortar is smooth. This wall is almost completely reused as foundation for the standing W wall (wall VII) between rooms 6 & 7, though with a slightly different alignment. c. 0.15 m visible at the most visible area in the south. The wall seems to be built against Wall I, since the plaster layer on wall I is smooth towards wall II (the surface is facing west) - therefore wall II must most likely postdate wall I. Built in lava and lime stones, large amounts of mortar, containing broken floor pieces, tiles, stones and lumps of mortar, plaster partly mixed with earth. A cavity at the same level as the terracotta pipe in wall I. diam: 0.2 m, depth 0.4 m, with a conical shape. It is possible it is a conduit, though no terracotta pipe and the conical shape might indicate other function? A line of stones along the E wall of room 7 was visible in the N end of the wall Before cleaning started. This is the west face of the wall II in room 6. However, only c. 0.1 m of depth was investigated. The wall seems to be built of lava stones, with one lava stone cut with a rectangular hole. The surface facing west is smoothened with earth mortar, no plaster found at this depth. At two locations there seems to be some kind of indication of a possible floor level, though the remains are too fragmented for any positivity conclusion to be drawn. A fragmented wall, just visible in the door opening to room 7, with a lava stone that aligns with the stone in the same material in wall Wall II. The wall has a different alignment than the later walls (VII) and it corresponds to the lava block under the E wall in room 7: could be a two part threshold, though no cuttings for pivot or other structures are visible (though not possible to exclude since major part of the stone is concealed under the standing walls). There is a preserved plaster layer in the center of the wall, however very fragmented: It continues around a possible corner, facing east and south (0.62 m from W), located as if it is a corner in a wall or some kind of structure. If the lava stone is a threshold, then this structure could be a partial closing of the door, a modification of the circulation pattern in the earlier layout of the taberna. Large amounts of lose earth and small pieces of broken tiles in the area to the north where the N face of the wall is completely destroyed, as the remains appear today! A wall built in earth mortar and stones, partly concealed under floor II: the stones visible c. 0.11 m below floor II, and for c. 1.1 m in length. The wall has a smooth surface facing east, no plaster or decoration visible. c. 1 m preserved, width not possible to see due to floor II. Wall built in earth mortar and stones, with a flat surface facing N, c. 90 degree to wall IV. No plaster or decoration visible. c. 0.6 m preserved, the width not possible to establish. Wall VI: The tuffa foundation for the S faÃ§ade. The tufa foundation for the S faÃ§ade extends out to the SW corner. 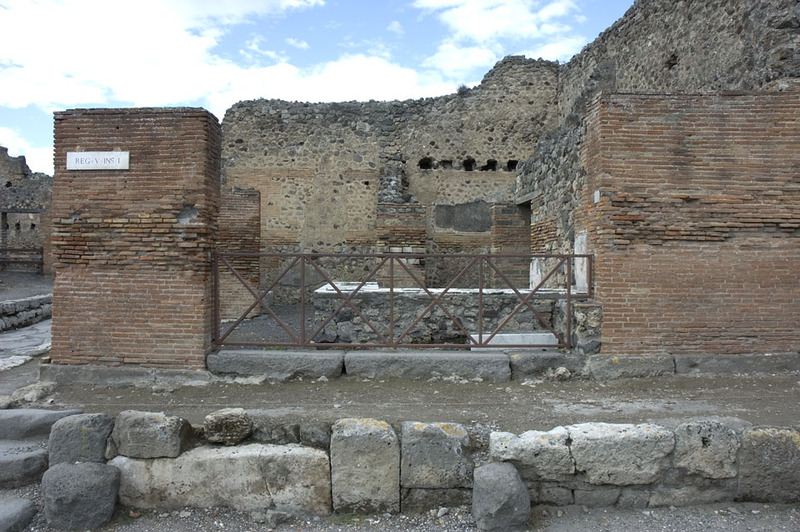 The faÃ§ade (wall VII) stands directly on these foundations, signifying that at least the large door opening to Via di Nola is of early origin. The corner building was excavated in 1748, as described by Eschebach, when several rooms/buildings were examined in the southern region of insula V 1. The cut up holes in the wall are witness to the continuous search after artifacts along Via del Vesuvio and Via di Nola in 1748. Identified as a thermopolium di Fortunatus by della Corte (Della Corte 1964, 126), here I use the term taberna, as a neutral word and to avoid the functional connotations. The documentation about the building is scares; G. Fiorelli presents the notebooks from the original excavations of the edifice in Pompeianarum antiquitatum historia and his own Descrizione di Pompei 1875. (PAH I 1, 2ff; PAH I 2, 35f; PAH II 426f; Fiorelli, Descr. 419.) There is no documentation in BdI, as found about other, later excavated houses in the insula. In the first book of PAH, treating the excavations 1748-1780, the taberna is described at one the very first pages of the excavations of 1748, at a stage when neither the identification of Pompeii was positive, nor the use of the region system introduces over a hundred years later by G. Fiorelli, was in use. To identify and establish the original description of this taberna is there for difficult to establish with certainty. Oldest plan found in print is Overbeck. Two more plans are presented in CTP (actually two, one in text and one in plan folder), and one in PPM. The two latter shows the counter, in Overbeck, the oldest, does not. There are several other features of Overbecks plan, especially the SW corner, where there are details which are undoubtedly ancient, are missing in the later plans. In the general plan over Pompeii presented in Dobbins the World of Pompeii, the taberna is presented with the same features as in earlier plans. In the first plans presented the buildings V 1,1.32 and V 1,2 were identified as one building. The assumed door between room V 1,1.32, room 2 and V 1,2, room 3 is a robbing trench/hole from either the earliest excavations or a result of the recovery process after the eruption. The shape of the cutting; high and round cut at the top, signifies the Bourbonian excavations in style. The masonry around the cutting shows no signs of a door post or any other feature that could be described as a door. The same kind of cuttings, and repairs, are found in the other walls: In room 2 to room 1, room 6 to room 7, and to V 1,31, room 2, and V 1,2, room 2. Cuttings of the same character is also found between room 1 and 2, in room 6 to V 1,2, and in room 7 to V 1,31 and V 1,2. Presumably the result of a possible systematic search through the buildings in the SW corner in1748? Plan of V 1,1.32. Established sept 2011. Facade Via del Vesuvio, door 32 in insula V 1. Facade Via di Nola, door 1 in insula V 1. The earlier remains (in dark grey) found under 79 AD floor level.